Which Type of Grant Proposal Should You Write? Do you feel daunted by the prospect of writing a grant proposal? It might not be as bad as you think. That's because not all proposals are the same. Many people think of a big, multi-page document as a grant proposal. But, in reality, there are several types of proposals. Which kind you write depends on which funder or foundation you've targeted and what your ultimate goal might be. In Winning Grants Step by Step (Buy from Amazon), authors Carlson and O'Neal-McElrath say that there are three types of proposals. Each one varies in length and substance. Which type you choose depends on where you're sending the proposal, what you are asking for, and how a particular funder prefers you to ask. A Letter of Inquiry usually goes to a foundation. It is, in essence, a way to pique a funder's interest in your project. You might choose to send several letters of inquiry to a number of foundations to see if your project fits with any of them. An LOI runs to only two or three pages that summarize your project. It gives a taste of what you are planning. With the LOI, you and the funder explore whether or not your idea is of interest. If it is, you will move on to the full proposal. Many foundations now prefer to receive an LOI as the first step toward funding. They can quickly assess whether your project is a good fit for them. If it isn't, they and you can move on. Your nonprofit might initiate the letter to test the waters for your idea. Or a funder may request it. Foundations typically include their preferences for a letter or a proposal in their guidelines. Those guidelines are usually posted on the funder's website. They also will be part of the Request for Proposals to which you might be responding. In any LOI, you will want to describe the need, outline the plan to meet it, and specify how the project fits in with the funder's priorities. 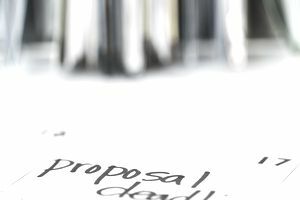 A full proposal is what we usually think of when we talk about grant proposals. It follows a fairly standard format that includes a cover letter, a summary of your project, and the amount of money you'll need from the funder. Proposals can range in length from five-25 pages. Be sure to follow all the funder's directions about how they want the proposal set up and pay particular attention to your cover letter, which is a mini-pitch in and of itself. Many funders, especially larger ones, now require grant seekers to use online applications to submit their proposals. There are special considerations for online applications, so make sure you understand how online submissions work. Take your time, write each section offline first, and triple check your work before submitting. Corporations often want a letter proposal rather than a long, formal proposal. You might be writing to a corporate foundation asking for a monetary gift or proposing a sponsorship or cause marketing program to the marketing or advertising department at the corporation. A letter of three to four pages usually is sufficient. The letter should describe your project, explain your organization, and include the actual monetary request or set out your sponsorship proposal. Although a letter proposal may seem to be easier, it is still a challenge to state your case succinctly in a briefer format. Don't confuse the letter proposal with the letter of inquiry. In the letter proposal, you are requesting funds. However, in the letter-of-inquiry, you are only introducing your idea to the funder to see if there is interest.